Happy to be a part of the Pearl Drums Europe drumming family! 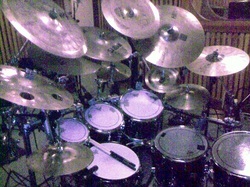 Eclectic drummer Atma Anur had been the "underground hero" of the San Francisco Bay Area music scene for over 25 years. After moving to the U.S. from his native England, Atma attended Stuyvesant High School and later CITY-AS-SCHOOL High School for the Performing Arts, where he became good friends with legendary artist Jean-Michel Basquiat, and began exploring the jazz-fusion roots of New York City. Atma continued his education by studying orchestral and tuned percussion at the MANHATTAN SCHOOL OF MUSIC. While still in high school Atma further "cut his teeth" by playing drums on the streets of Manhattan in various jazz groups, and also played in the now infamous "NY LOFT JAZZ" scene in SOHO, with artists like Joe Bowie, Luther Tomas, Drowning, 190 PSA and many others. Atma also played experimental jazz duets (drums and electric bass) with Efraim Schwab. Atma and Efraim have also written a book on poly-rhythmic harmony and rhythmic understanding together (unpublished). Atma continued his musical study at the BERKLEE COLLEGE OF MUSIC in Boston, where he studied jazz composition and performance. There he studied with great players like Ed Kaspic, Joe Hunt, Tommy Campbell, Rodney Smith, and the legendary Lenny Nelson. Atma’s guitar virtuoso sideman credits also include commercial guitar heroes Joe Satriani and Doug Doppler. Two of Doug and Atma's CDs: GROUND ZERO and NU INSTRUMETAL, were released in 2007 by Steve Vai's FAVORED NATIONS record label. Atma also recorded many CDs with Richie Kotzen, on various record labels between 1989 and 2005, including the Geffen Records release: MOTHER HEADS FAMILY REUNION and the BILL and TED'S BOGUS JOURNEY sound track. Atma has also played with blues legends like San Francisco's own Jonnie Nitro and the renowned Carlos Guitarlos. Atma also recorded and toured with the Los Angeles based Slackjaw Blues Band , featuring New Orleans blues/funk legend Ivan Neville. 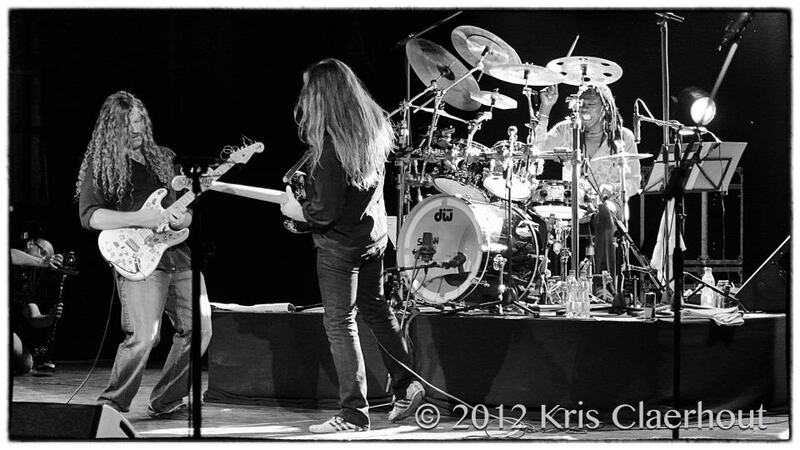 Speaking of the blues, Atma also had the pleasure of playing with Gregg Allman, who says of Atma "man you sound like a skinny Bernard"...(Purdie). Atma's first gig after leaving college at age 19 was with the world famous COASTERS and the legendary Bobby Day, in the Miami Beach Resort Club circuit. After moving to San Francisco in 1981 Atma played in the then flourishing local jazz scene, at clubs like Fillmore's and Bajons. Here he began to develop his eclectic abilities and played in as many as 7 bands at a time, in many styles of music. During this time Atma also toured and recorded with the world famous PICKLE FAMILY CIRCUS among others. Atma became a valued musician and drummer for Mike Varney’s SHRAPNEL RECORDS in the mid 80s, and recorded a great many CDs on that label. Most of these CDs were recorded at PRAIRIE SUN RECORDING, located in Cotati Ca. Run by Mark "mooka" Rennek, it is one of the Bay Area's best recording facilities. On Shrapnel, Atma played with pivotal musicians such as Jason Becker, Marty Friedman, Tony MacAlpine, Cacophony, Greg Howe, Richie Kotzen and many more of Mike’s amazing guitar discoveries. Under Mike Varney's direction many of these CDs were engineered and mixed by GRAMMY AWARD winning producer Steve Fontano, and Prairie Sun's own "mooka" Rennick. Some of Atma’s other recording and playing credits are like a who’s who of music and include artists in most every genre of modern music. They include heavy metal masters like Vicious Rumors, and Metallica's own Jason Newstead (Groove Stang). 90’s hard rockers like Hardline, XYZ, Two Fires (formerly The Storm), and work with other great rockers like Peter Marino’s Lemans, Davy Pattison, Tim Gorman (The Who) and Kevin Chalfont. 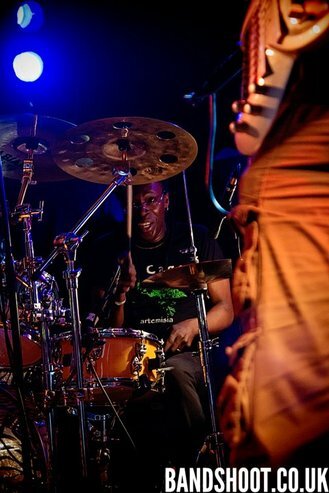 Atma also drummed in almost all of Steven Jenkins' many projects over a 20 year period, including Bongo People, Puck and Zen and then the world renowned THIRD EYE BLIND. Atma also stayed true to his roots by playing live with ska legend Dave Wakeling (English Beat, General Public). This black dreadlock rocker has also played with Josh Ramos (The Storm, Hardline), Alex Skolnik (Testament), Peter Keys Pisarczyk (Lynyrd Skynyrd), Steve Smythe (Nevermore,Testament, The Esseness Project), George Lynch (Dokken), Brad Gillis (Ozzy, Night Ranger) and artists like Santana's Chipito Areas, Mingo Lewis, Micheal Carrabello, Bill Sommers, Arthur Rhames, Arturo O'Farrell and even the great composer Sammy Cann. Atma also played with John Goodsal's BRAND X... euro fusion at it's finest. Atma’s musical history as a sideman also include a stint with 80s super group JOURNEY (where he shared the spot light with AMERICAN IDOL’S own Randy Jackson... who played bass in the band at that time), and a recording with vocal icon David Bowie. During the 80s Atma kept up with his roots playing in the Bay Area's very popular WORLD BEAT music scene where he met and played with Les Claypool (Primus). Atma also played hard rock rap with Screamin' Wolf' and the DEF MFs, who were forerunners of the whole "rock/ rap" thing that broke in the Bay Area in the early 80s. Atma also played live with old school Hip Hop/jazz with Bammie Award winners MIDNIGHT VOICES. And with some time left in his day, Atma also played reggae and funk with Bill Summers (Head Hunters), Michael Bolivar, and Bay Area legends, George and the Wonders. Atma made his splash on the punk rock scene in the 90s playing drums for the drummer of the legendary Dead Kennedys, D.H. Peligro. Atma and D.H. made 2 CDs together and played many shows and tours, including a tour where they co-headlined Brazil’s famous three day “Parao do Rock” (underground of rock) concert, performing for 35,000 people. Atma’s greatest love in music is fusion. One of the most important fusion bands for Atma is the Mahavishnu Orchestra,and he has played with two of the violinists from the band; Steve Kindler and most recently with Jerry Goodman. Atma and Jerry are featured on guitarist Lindsey Boullt’s last CD, "Composition", along with Derrick Sherinian (Dream Theater), Stu Hamm (Joe Satriani), and Jon Herrera. Sukavat Ali Khan also makes a special vocal appearance on this epic mostly instrumental CD. More artists Atma has worked with include Grammy Award winner Ian Cross, folk/blues legend Michelle Shocked, and bass masters Billy Sheehan, T.M. Stevens, Marco Mendoza, Andy West (Dixie Dreggs), Uriah Duffy, Benny Reitveld, Doug Wimbish and Glen Hughes of Deep Purple fame. With the great Marcel Coenen at the Jason Becker Not Dead Yet Festival... Metal ballad! Atma's move from The States finds him working in Italy with Italian guitarist Steve Saluto on the recording and touring project, LAFAMIGLIA SUPERSTAR. In 2008 Atma worked on a new commercial metal project with guitarists Piotr Konca (of renowned Polish rock band, IRA) and Sebastian Piekarek (DODA), and has also recorded new music with Pawel Maciwoda (SCORPIONS). 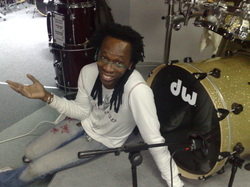 Atma has played live throughout Poland with Maryla Rodowicz, and with the highly regarded Polish pop/rock band Wawele for their 2008 tour. Some other Polish artists that Atma has worked with include Karim Martusewicz, Ewelina Flinta, Wojciech Waglewski, Wojciech Hoffmann and the ZAGADKOWA BLONDYNKA - "Travel Band" for the 2009 TV series ZAGADKOWA BLONDYNKA. Since 2007 Atma's love of instrumental music has found him recording as a side-man, with a wide range of exceptional and gifted European, Asian and American instrumental guitar artists that include Joop Wolters, Taka Minamino, Franck Ribieri, Bert Elliot, and Florian Hofer...to name a few. And recordings with vocal artists like Alen Brentini, Romanian pop rocker Alina Alens and Indian vocal star Nandini Srikar. In 2012 Atma began working with more Eastern European musicians through the internet, recording and making "in studio" videos with artists like Boznian guitarist Emir Hot, Romanian guitarist Calin Grigoriu Hungarian guitar players Janos Kallai and Jani J. Szentkiralyi and Serbian guitarist Nikola Stakic-to name a few. 2016 brings Atma to continue his studio recordings for artists like German fusion guitarist Ed DeGenaro and many more.